Today really began at the farmer's market. But it didn't get good until I pulled these pumpkin muffins out of the oven later in the morning. They are so light and airy, so perfectly soft. And they mix up pretty quickly - I had them mixed, baked and served in not much more than 30 minutes. Pumpkin has hit the shelf of every grocery store in the continental US by now. I topped half the batch with streusel as a sop to the children. It's early in the fall, and they sort of forgot that they like pumpkin. But streusel they KNOW they love. Cream canola oil and sugar in a mixer with paddle attachment for 2-3 minutes. Add pumpkin puree and eggs and mix well to combine. Add one half of the dry ingredients to the mixer and blend slowly for half a minute. Add the rest of the dry ingredients and mix until just blended. Finish mixing by hand with a spatula, scraping the sides and bottom of bowl to incorporate. Transfer to greased muffin tin (I like to use an ice cream scoop to do this). If you want to use streusel add it on here, just 1-2 teaspoons atop each unbaked muffin. Bake for about 20-25 minutes or until just done. Cool for five minutes in the pan, then serve. Can be stored in a covered container at room temperature for a few days - but they're best right outta the oven. We are squarely in Holiday right now with Halloween around the corner. We got jiggy with costume-making this year, and are festooned with pumpkins and Brach's Candy Corn, the only candy corn. Soon enough we roll into Thanksgiving and Christmas, with even more decorating, cooking and caroling. Holiday is AWESOME! I love Holiday as much as I loathe Long Monkey Winter. Chicago's cold, interminable drear of January, February and March remains a sticking point for me. I don't think I'll ever stop missing the sparkle of sun on snow in the mountains. Anyway, the outside temperature is inversely proportional to the magnitude of hot peppers used in the Pinch kitchen. I'm not talking about full-on SPICY food, here - just a little sprinkle of cayenne here and an extra shake of chili flakes there does wonders for raising your body temp, keeping you toasty and just maybe fighting infection. It's like Green Eggs - just try it and you may like it. I got cooking early this morning so that we could enjoy Italian Beef Sandwiches and Parsley Cashew Green Beans tonite. If you have a slow cooker, you can use it here. I don't - so I cook a tri-tip steak all day in a 200 degree oven, tucked inside a lidded French oven. It smells SO good all day. Get yourself a good jarred Giardinera for this - I like the hot, but you could cocktail the hot and mild. Tomorrow will feature Adventures in Mole, Part 2, when Araceli (of Mole Verde fame) teaches me a red mole. I shopped for the chilis recently - pasilla, ancho and mulato - they're big and plump and I can't wait to try em. Also on the menu this week is Rice Penne Pasta with Lemon and Artichoke Hearts, Salmon Sandwich with Dill Aioli, Chicken Pesto Salad with Jicama and Late Season Tomatoes, Orecchiette with Italian Sausage and Broccoli Rabe and an Asian-inspired night including Asian Chicken Lettuce Wraps and Wonton Soup. Oh, and I'm learning how to steep my own Yogi tea! Will include that recipe once I get it down. Happy Holiday! This was sent to me by a relative I'll call Tim and, boy, was it an adventure. To begin with, receiving something so out of the ordinary was a total thrill. Plus, there was the element of criminality; the package clearly states that resale is verboten. 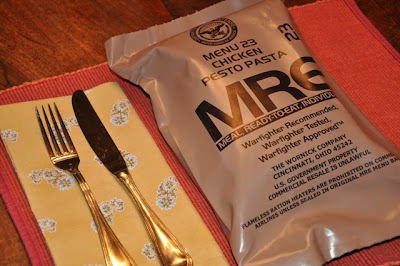 Of course, my MRE was a gift, so Tim and I should be safe from prosecution. I'm curious about the daily life of our troops - even more so since hearing the bit about $400 per gallon gas (and going thru over 800,000 gallons a day in Afghanistan). Speaking of intrigue concerning our armed forces, I'm surprised we don't have war shows on TV, something a la Friday Night Lights. But back to the MRE. Upon first inspection I was pretty impressed by the Armed Services menu option #23, and Tim’s choice for me - Chicken Pesto Pasta - way more highbrow than the beef, peas and potatoes of yesteryear. Regular readers know Chicken Pesto Pasta is in regular rotation on the Pinch menu. The MRE (Meal, Ready-to-Eat) is a lightweight packaged meal containing a main course, side dish, bread, dessert, hot and cold beverage mixes, and flameless ration heater. This field ration has been around since 1981 when it replaced the MCI (Meal, Combat, Individual). MCI were canned, wet rations issued by the U.S. Armed Forces beginning in 1958. (Click here to watch a clip of a retiring Army Colonel tasting a 40-year old pound cake he brought back from Viet Nam.) Be prepared for disappointment if you're curious about what exact preservatives are involved in keeping a pound cake fresh for forty years - it's something of a Don't ask, don't tell policy, I'm sure. We took the MRE to the park to simulate an out-of-the-kitchen cooking and eating experience. But since I didn't open it until we got to the park and didn't bring water, we ended up preparing it back home. There was a lot to praise in the MRE. The directions for the flameless heating element were clear (my favorite part had to do with placing the heating entrée on an incline – the written direction said "Lean it up against a rock or something") and the unit put out some serious BTUs. Nutritionally, the meal was sound in terms of protein/fat/carb percentages. The Institute of Medicine found that the typical serviceperson burns over 4000 calories per day yet was consuming only about 2400. Giving our troops healthy but good food that they will want to eat will ensure that they are getting the calories they need. The meal was balanced well for salty/sweet cravings and contained grab and go items that were completely ready to eat. (The entree, which is intended to be heated - NOT ready to eat -requires about 15 minutes of heating time in addition to the rock.) But with 24 different menu options it seems there's something for everyone. Most are comfort type foods like Meatballs in Marinara, Chicken with Noodles, and Beef Stew, and a couple of Mexican options, enchiladas and fajitas. Now the negatives. For starters, it wasn't tasty. It's hard to imagine that there's not substantial waste involved in MRE shipping and distribution. Given the preservatives needed to keep them shelf stable for over three years, the ingredients list was, like, a mile long. While the entree tasted better than I expected, it was by no means appetizing. The wet pack of pineapple was tasteless and messy to eat out of the slim package. Dried pineapple or mango would have been better. The chocolate pudding was ok, but it should have been chocolatier. Come on! Give the troops more chocolate! The non-fruit drink was essentially sugar water. I allow that at some point a calorie IS a calorie, and finding ways to get servicemen ingesting more calories might mean including some empty ones. But sugar water? Couldn't there at least be some vitamins involved? - MREs must be able to withstand parachute drops from 380 meters (1,200 ft), and non-parachute drops of 30 meters (98 ft). Um, what CAN withstand a non-parachute drop of 30 meters? - In March 2007, The Salt Lake Tribune invited three chefs to taste and rate 18 MREs. No meal rated higher than a 5.7 (scale was from one to ten) with the Chicken Fajita meal receiving the lowest average score (1.3). All in all, while MREs have improved over the years, they need to look and taste better. It really seemed like prison food, tucked into individual portion packs. And that's sad. Got more time? Click this. This is interesting. The "Really?" column is so current (so Seth & Amy, too) for the old NYT, and I love them for it. Their recent look on the effect of garlic on colds caught my interest since it looks to be a long monkey winter in Chicago. Only the study concerned itself with garlic supplements, with no mention of the garlic we cook or consume raw. I like my garlic with a bite - that is, I don't so much enjoy that circa-1990 roasted elephant garlic novelty. Half the time garlic gets used in the Pinch kitchen it's pressed (using the Zyliss Susi) right into something - tapenade, salad dressing, my mouth. The other half of the time it's smashed to remove the skin and sauteed whole in olive oil with a sprinkling of chili flakes for good company. The only roasting exception is when I'm roasting potatoes with rosemary and garlic - garlic goes into that dish unpeeled. Don't ask me why, just try the potatoes sometime (a bunch of new potatoes, tossed olive oil, kosher salt, 6-8 unpeeled garlic cloves, and a 4-5 sprigs of rosemary - roast at 425 for like 40 minutes, shaking the pan midway thru the baking time.) I like them for weekend brunches, but they're also great for Sunday dinner-type menus. 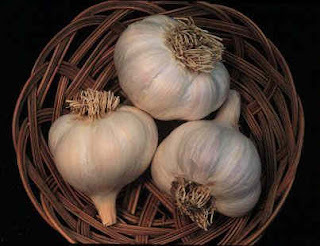 Anyway, if your cold & flu season has started, you might consider adding a bit more garlic to your diet. I know I will. Thanks, Wizard Recipes, for use of the photo. I've been down memory lane today. Not on purpose, really. A Fall Cleanup is underway and I'm sorting thru all sorts of clutter. I'm halfway thru the front steps (the dirt I thought I was scrubbing off seems to still be there), have tackled the game cabinet and the arts-and-crafts cabinet. One of the goals of the day was to locate my daughters' charm bracelets - but they remain elusive. And I can't blame the girls for losing them because I was the bracelets' keeper. See, I got them charm bracelets a few years ago, and a few charms since. But since charm bracelets are more sentimental than practical (neither of the girls have been begging to wear them) I've been slow to take them to a jeweler to have the charms fastened. And now I can't find them anywhere. I have found lots of other interesting things, notably: a LOT of stamps in odd places (a half-spent pack of thirty-seven-centers in a purse); a thank you card for a robot hornet, the purchase of which I lack recollection; a Mix CD a friend made for me a few years back when people still made mix CDs (I moved it to my car where I'll listen to it soon); a ticket stub from Lake House - that Keanu Reeves/Sandra Bullock movie I hated in the theater because Bullock's character was such a downer (but then went on to watch a few more times when it came around on HBO because of all the Chicago scenes and the bits with Christopher Plummer); several STARBUCKSCARDs (tho the only reason Fall Cleanup is even happening today is because I'm totally cracked out on espresso, so the card is useless to me); and lots of very sweet cards from my children that I didn't put away in the box of stuff I save precisely for days like today when I would happen upon them and smile, stop for a moment and count my blessings. One thing on the menu all week: lettuces picked from my AeroGarden. This is my first kit of lettuces (previous kits were all herbs) and I'm loving it. We've had several great salads already and it's so fun to watch the greens replenish themselves after harvesting - it's usually only 2-3 days before I can pick another big bowl of tender leaves. The week started slowly in the kitchen. I never made it shopping yesterday and was under the weather over the weekend. But now the fridge is stocked and I know what we're going to eat all week. And, as usual, I'm pretty excited about all of it. For one, it's chanterelle season - one of my favorites. If you've not cooked chanterelles before I recommend starting pretty much immediately. They're not grown locally, so I can't get them at the Green City Market. I got mine at the Saturday market in my neighborhood. Anyway, ask at your market or grocery store. They look and taste like autumn. I like to clean them off with a damp paper towel, slice them and saute them in a smidgen of olive oil along with a pinch of chili flakes and a whole garlic clove. You could add white wine for a nice pasta sauce, or scatter them on a pizza and top with fontina, or make the risotto I've got planned. Just tonight we enjoyed Grilled Pepper-Sugared Salmon with Artichokes and a Fall Salad. We had these gorgeous jumbo artichokes and some great Coho salmon dusted with Mendocino Seasoning Sand. I just love a good blended seasoning and this one, received as a gift, is really lovely on salmon. It's sweet and peppery. A little goes a very long way. If you want to try to recreate the flavor, start with about about two teaspoons of brown sugar, fresh ground pepper, and some kosher salt. Maybe add some lemon zest. Mix it all together, taste and adjust to your liking. Sprinkle sparingly on salmon and grill. Also this week: Buffalo Burgers with Corn on the Cob and Avocado Salad - kind of a summery meal but it works since peppers and corn are still abundant at the market. I'm hopeful that Bennison's will bring burger buns to market tomorrow since I forgot to add them to my shopping list. Let's see, there's Spanish Omelet with Seatown Salad, Asian Pork Tenderloin with Broccoli and Rice, Flank Steak Fajitas with Spanish Rice and Guacamole, and something we've not had in quite awhile: Gnocchi with Basil Pomodoro and Grana Padano. For this, I'll just add very thin sliced basil to my standard pomodoro sauce, and stir it into the gnocchi with lots of grated Grana - my favorite Parmesan. Mmmm. I think I'll make that one tomorrow. It's been cold this week and the warmth of spices and comfort of deep colors is very much intentional. Hope you're staying warm wherever this finds you. The biggest problem with city life is that it precludes chicken ownership. If you read Susan Orlean's Chicken Chronicles in a recent New Yorker you know what I'm talking about. Of course this is the Susan Orlean of Orchid Thievery-Adaptation fame. I'm just saying, she does tend to get carried away. And now she's got me daydreaming about a red Eglu and Gingernut Ranger hens. Thanks, Susan. Another problem with city life: it's entirely possible that there's a hit on me. My dog just LOVES squirrels. Bode is getting on in dog years and doesn’t have a lot of speed left in him but he usually makes an effort to stalk a squirrel. We egg him on, inciting him to GET THE SQUIRREL. It always ends the same way, with the squirrel running up a tree. Of course one day Bode did get one. The “one” in this case was definitely a squirrel of sub-par intelligence, an unfit squirrel in the Darwinian sense. This substandard specimen was safe overhead in a small tree but decided a better move would be to launch itself onto a nearby taller tree that was, in point of fact, not a tree but a lamp post. With no bark to cling to, he slowly slid down the post like a frightened, furry fireman and into my dog’s eager smile. Oh, it was so awful. I started shouting LEAVE IT! LEAVE IT! Poor Bode, who was pleased as punch at his good fortune, mulled it over for a second or two, then dropped it, reluctantly. Relieved, I watched the squirrel quickly gimp away. Now, the fact of the matter is that I like squirrels just as much as my dog (an ominous indicator of personal fitness, in the Darwinian sense). They’re just so darn cute with their scampering and nut gathering. Anyway, a few months after our run-in at the lamp post, reports of Rogue Squirrels started hitting the wire. Turns out some squirrels were doing some stalking of their own, and launching themselves out of trees and onto the unsuspecting heads of passersby. The incident at the lamp post left me convinced of imminent retribution so I prepared for certain attack. I tried imagining my response to having a squirrel drop onto my head, but I couldn’t figure it out. What should one do when this happens? Surrender was almost sure. 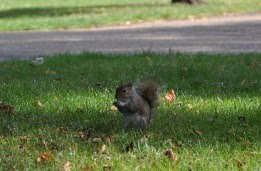 If I were attacked by a squirrel I would be at its mercy. At this point, you have put the squirrel in it's place but you are by no means safe from future attack. I think it's kind of like lightening, in that it actually does strike twice. You should return home, pack your bags and move to the country. And get some chickens. * If you really want to put on a show for any gathered spectators try this: Throttle the squirrel within an inch of his life then suddenly release him. As he wobbles off, shout at him: YEAH! TELL YOUR FRIENDS, TOUGH GUY! 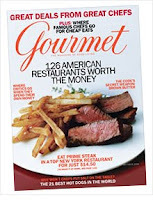 Reichl has done an outstanding job at Gourmet. I've been a quiet fan of hers since reading her memoir Tender at the Bone. But then she came out with Comfort Me With Apples. See, the first book introduced her and made me like her. 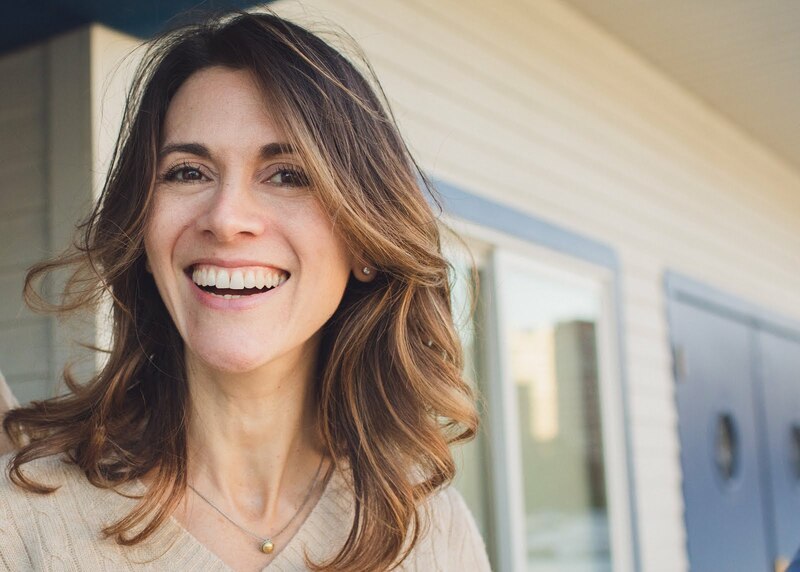 But in her next book she told me all about her affair with Coleman Andrews (founder and former editor at Saveur) and it was just TMI. It's getting colder. It's tea and soup season. And this is the year that I'm going to learn to make a good chicken soup out of a CHICKEN! Chicken totally grosses me out. It ain't right, but it does. For this soup I'm going to get a nice farmer's market chicken, and cut it up (blechk), and make me a nice chicken broth, just like Aunt Jennie used to make. I should have learned this lesson already, but I've avoided it. Pinch readers know my affinity for Imagine organic chicken broth. This week we'll be eating Wagamama Noodle Soup with Teriyaki Pork, Cornmeal-crusted Tilapia with Quinoa, Chicken Soup with Wild Rice, Coriander Dry-Rubbed Steaks with Avocado Salsa, Pan-fried Salmon on Arugula, Lemon Chicken Fricassé and an oldie, Herb Frittata with Pepperonata. The frittata will be great on Bennison's little ciabatta rolls, so I guess we'll have that on Wednesday when the Evanston bakery brings its goods to the Green City Market. I like Bennison's a lot. I hope they continue to come to the GCM once the show moves to the Notebaert. I don't do Evanston, not even for ciabatta. Nothing against Evanston, of course, it's just too far to drive. I've pretty much given up on Metropolis as well, as I can't justify driving 10 miles for coffee beans. Yeah, I'm buying Peet's again. Espresso Forte! The lemon chicken fricasee thing is pretty simple - rinse and dry boneless skinless chicken breasts and then beat the crap out of em. Do it nicely and evenly, preferably with one of those meat pounder mallets. Then dust them lightly with a mixture of salted/peppered flour and cook in a preheated skillet in a teaspoon or so of olive oil. You want to sort of brown both sides, and then toss in the juice of 1-2 lemons and a tablespoon or so of finely chopped parsley. Cover immediately and cook another 1-2 minutes until the chicken is cooked through. Then serve. Make sure you do your mise en place with this one -get your lemons juiced, your parsley chopped and the cover to your skillet nearby before the chicken hits the pan. And be ready to set and eat as soon as it's done cooking. For the chicken soup-from-a-chicken, I'm going to follow Sherry's method of boiling a whole, cut up chicken for about and hour, then removing the meat and bones and adding veggies to the stock (carrot, celery, onion, parsley). I'll let that simmer for about an hour or so. Then I'll probably walk away from it for a few hours. Later, I'll strain out the veg, sort thru the meat and add the good stuff back in. And I'll add some fresh veg, too - nicely chopped carrots and celery - but I'm not sure when, as I don't like them to be overdone. I'm unsure about total simmering time as well, tho the plan is to start early. Please share your advice for turning a chicken and water into a flavorful soup. I need all the help I can get. I'm spending a cool, quiet fall afternoon with a cup of tea (Irish Breakfast, plus a splash of milk and honey), a candle (Autumn Promanade), and a oven filled with pecans. If the calendar or weather report doesn't herald autumn's advent then the scents in my kitchen surely do. I had to pay attention as I mixed the magic elixer for my pecans - I usually just pour in a little of this and a splash of that. If you've never made them before, I recommend that technique - just use my recipe as a guideline. These are really nice with a little kick - hence the cayenne. If you don't believe me, then just add the tiniest pinch. It'll still be a nice seasoning and you won't get any heat. You can store them in an airtight container for up to a month, I would think. They are so tasty that they never last that long. They are truly delightful scattered on fall salads, especially the Pinch House Salad with pear and Gorgonzola, and the Warm Goat Cheese on Mixed Greens. Combine syrup, oil and spices in a small mixing bowl. Taste and adjust seasoning to your liking. Add pecans and, using a flexible spatula, toss well to coat. Use the spatula to scrape the sides and bottom of the bowl so that the syrup coats the nuts and not the bowl. Transfer to a baking sheet and bake in the oven for about 30-45 minutes, stirring a few times during roasting time. Let cool completely, then transfer to an airtight glass storage container.